Check out iMobie Apple iPad Wiki, including the latest iPad news, in-depth iPad reviews, iPad rumors, and resourceful iPad how-to tutorial. Download this award-winning application so that you can make use of it after reading this Apple iPad WiKi page. The iPad is a line of tablet computers designed and marketed by Apple Inc. The first iPad was released on 2010; the most recent iPad models, the iPad 4 and iPad mini, were released on 2012. The user interface is built around the device's multi-touch screen, including a virtual keyboard. The iPad has built-in Wi-Fi and, on some models, cellular connectivity. 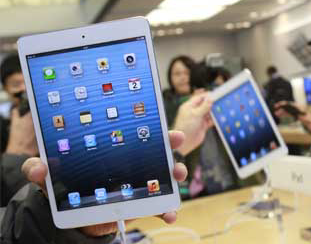 An iPad can shoot video, take photos, play music, and perform online functions such as web-browsing and emailing. Other functions - games, GPS navigation, social networking, etc. - can be enabled by downloading and installing apps; as of 2012, the App Store offered more than 700,000 apps by Apple and third parties. So far there are five generations of the iPad. The iPad 1 established design precedents, such as screen size and button placement, that have persisted through all models. The iPad 2 added a dual core Apple A5 processor and VGA front-facing and 720p rear-facing cameras designed for FaceTime calling. The iPad 3 added a Retina display, the new Apple A5X processor with a quad-core graphics processor, a 5 megapixel camera, HD 1080p video recording, voice dictation, and 4G (LTE). The iPad 4 adds the Apple A6X processor and replaces the 30-pin connector with an Lightning connector. The iPad Mini features a reduced screen size of 7.9 inches, in contrast to the standard 9.7 inches, and features similar internal specifications as the iPad 2. iOS 6 adds Siri to the iPad 3, 4 and the iPad Mini. How to Transfer EPUB PDF Files to iPad - PhoneBrowse is the best iPad file transfer and manager freeware made for helping you access iPad file system freely. Transfer Files from iPad to PC, iPad to Computer - How to transfer Music, eBooks and other files from iPad to PC? Find free iPad file browser software which helps you browse iPad file system. Transfer iPod Music to iTunes Library - Have you make a backup to prevent crash on your computer? PodTrans Pro allows you transfer music from iPod to iTunes library for saving media content in it. Copy Music from Computer to iPod - Used to use Windows Media Player to listen to music and want to learn about how to transfer music from computer to iPod without iTunes?